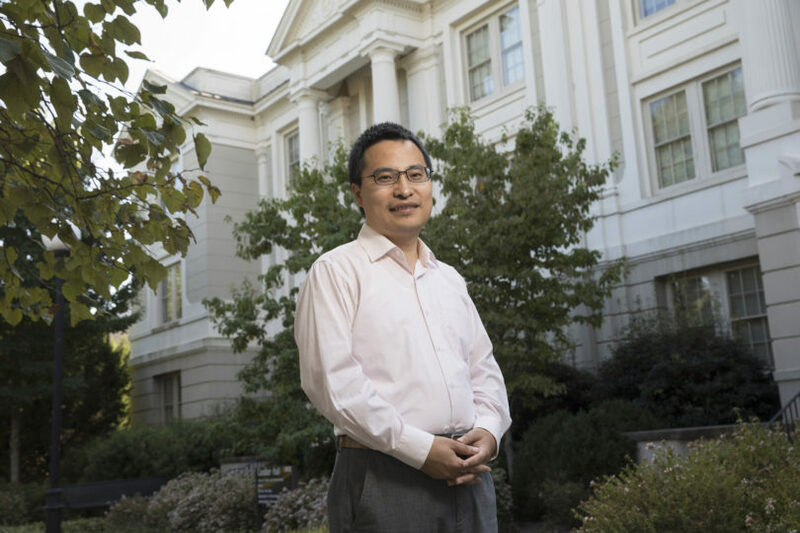 Rongbin Han, an assistant professor in the School of Public and International Affairs, introduces students to the complicated relationship between digital media and politics in the contemporary world. I have been educated in China, Singapore and the United States. I grew up in China and earned my bachelor’s degree in international studies from Peking University in Beijing. Then I studied at National University of Singapore, where I obtained my first master’s degree. My second master’s degree and Ph.D. are from the University of California, Berkeley. I am currently an assistant professor in the department of international affairs, which is part of the School of Public and International Affairs. I teach courses on digital media, China, East Asian politics and comparative politics in general. My research centers on social activism, media politics, political participation and democratization, with an area focus on China. I teach several courses and I enjoy all of them, especially the interaction with the students. “Global Politics and Digital Media” is an undergraduate course that matches my specialty and the needs of students very well. The course introduces students to the complicated relationship between digital media and politics in the contemporary world. In the course, I ask students to design and implement a digital media experiment through which they can reflect on the implications of everyday digital media experiences such as Facebooking, Twittering and Instagramming. Such experiential learning opportunities not only allow them to relate what they learn in the class to their lives, but also enrich their understanding of politics in the digital age. In fact, previous students were often surprised by the digital power (or the lack of such power) they found. Faculty members are lucky, as both research and teaching are incredibly rewarding. As far as the highlights are concerned, the year of 2018 has been nice to me. My first book, “Contesting Cyberspace in China,” came out in April through the Columbia University Press (it is available on Amazon). A significant portion of the research and all the revisions were done at UGA. This is an important milestone in my career that manifests my achievement in the past as well as the starting point for new, exciting projects. Also, my co-authored article on rural democracy in China won the 2018 John and Vivian Sabel Award for the best article published in the Journal of Contemporary China. I was invited to deliver the keynote speech at the reception at the University of Denver, which is where the journal is based. It was an exciting experience. I am broadly interested in how the state and citizens interact, especially in authoritarian regimes, and my recent focus in cyber politics. Upon learning that I am from China and study cyber politics, people outside my field often become immediately interested in how the government limits freedom of expression and suppresses Chinese citizens, as well as how citizens can fight back. They ask questions about how powerful the internet is and if it will help bring down the authoritarian Chinese regime. My recent book is precisely about state-society interaction in Chinese cyberspace. It investigates the struggles over online expression from two angles: (1) a more conventional angle that examines the cat-and-mouse censorship game in which state, service providers and internet users fight over what can be expressed and what cannot; and (2) a less studied discourse competition angle that explores how the state, dissidents and various groups of netizens compete to advance their preferred discourses online. The finding is two-fold: (1) the Chinese party-state can almost indefinitely co-exist with the expansion of emancipating internet; (2) but the key explanation for this co-existence does not lie in the state’s capacity to control and adapt, as many have argued, but more so in the pluralization of online expression, which empowers not only regime critics but also pro-regime voices, such as pro-state nationalism. My research informs me about Chinese politics, media studies and authoritarian politics, which are practically what I teach. So in my classes I have been introducing my latest projects as well as the progress in the field to students. As a researcher, I am not only sharing findings with students, but also can show them how we have arrived at those findings. This is why I ask students to do the digital experiment in my global politics and digital media course. Teaching benefits my research, too. I am always excited when students ask tough questions, as those questions can be inspiring. If there are no ready answers, they mean new research opportunities. Moreover, students are getting involved in my research. I have even co-authored a paper with an undergraduate student, which is to be submitted soon. For undergraduate students, I hope they learn essential facts about the subject matter as well as conceptual and theoretical frameworks for making sense of these facts. But more importantly, I hope they can maintain a constructive, critical attitude that never takes anything for granted while remaining open-minded to new facts, ideas and values. For graduate students, my goal is to prepare them for a successful academic career. Besides training them in research skills, I want them to put research questions first and master the tools rather than being mastered by the tools. Motivated, hard-working and open-minded when encountering different views and ideas. Walking through North Campus any time of the year—even in the summer—especially around Herty Field. I enjoy traveling to different places around the world, but since my daughter was born in December 2016, all my off-campus time is hers. She loves Memorial Park and Bear Hollow Zoo, so we go there a lot. 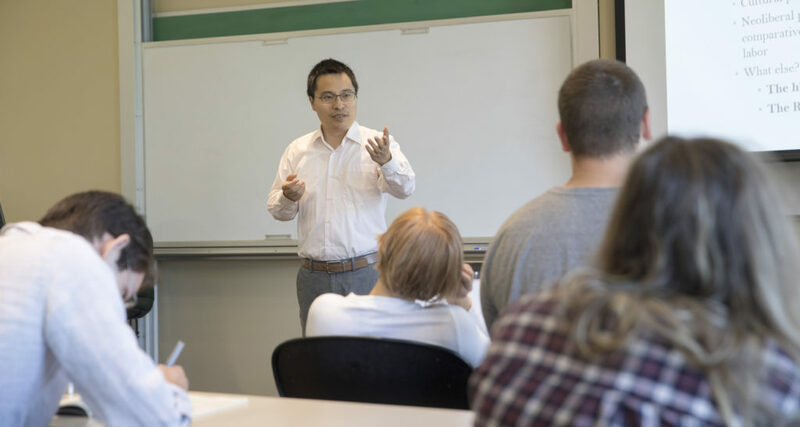 Every summer since I arrived at UGA, I have served as an instructor for “Teaching East Asia: A Seminar for Teachers,” a professional development program funded by the Freeman Foundation for K-12 teachers across Georgia. My favorite movie is “The Matrix.” I am a sci-fi fan, and such movies allow me to relax and at the same time are somewhat related to my research interests. Technological development and the fate of human beings, what a fascinating theme. My favorite book (not about research) is “The Three-Body Problem,” again a work of science fiction. It is written by Chinese author Cixin Liu. The book explores the fate and struggle of the human race when coming in contact with extraterrestrial intelligence. I followed every episode of the TV series “Person of Interest,” which is about artificial intelligence and its implications for humanity. Too bad CBS has discontinued it. The moment when a man delivered an edible fruit flower bouquet to my door after the birth of my daughter. It was from my department, together with a greeting card from all of my colleagues. That was truly a pleasant surprise.